Whether you throw for sport, combat or skill, the new Aero Strike throwing knives will put you right on target. 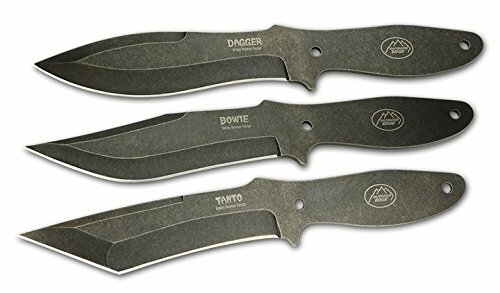 Designed by professional knife thrower Bobby Branton, this precision crafted trio of Tanto, Bowie, and Spear Point blades are equally weighted and balance so all three blades throw and fly uniformly. Each blade is crafted from 420J2 stainless steel with a durable Blackstone coating. Holes in the handle allow for paracord wrapping to create a 3-knife survival set (paracord is not included). The Aero Stirke thrower comes complete with a nylon belt sheath.